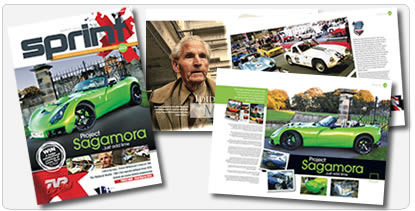 Everyone receives Sprint, the 64-page monthly full colour A4 magazine packed full of TVR related articles, photographs, motorsport reports, specialist companies and one of the largest single monthly listing of TVRs for sale anywhere in the UK. It is not available to non-members. It has won a series of industry accolades including either winning or taking runner-up as Best Car Club Magazine from Classic and Sports Car Magazine every year since 2006.